Today we watch a very good cartoon by a great Soviet art-director Eduard Nazarov. We already watched some of his cartoons about Vinni Puh (or how sometimes they spell it Vinni Pukh).That is a Russian version of Winnie the Pooh. Here you can read some our articles about our favorite Russian series about Vinni Puh. For people who wants to know more. 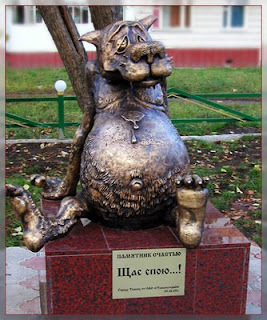 They put a sculpture of the Wolf by Leonty Usov in Russian city Tomsk in 2005. This sculpture can talk some famous phrases from the cartoon (like “Щас спою!/I wanna sign!”) if you rub his belley. The name of this sculpture is “Monument of happiness”. This entry was posted in Cartoons on June 20, 2008 by admin.